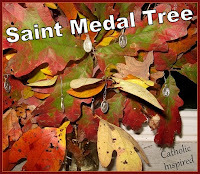 Home » All Saints Day Decor » Fall Decor » An All Saints Day Display with a Twist! An All Saints Day Display with a Twist! I thought I'd share a display I made with my kids today! During our art class today we made these cute twisted trees and pumpkins! 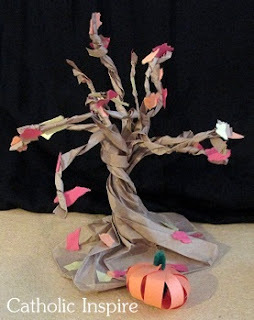 The style in which I made the paper pumpkins is similar to these. 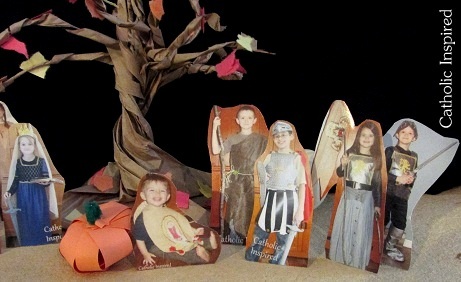 And then I printed off a few pictures of my kids in there saints costumes and we stood them around our trees! I used a paper clip to stand the photos of the kids. Just unfold it and tape one end onto the photo as pictured below. 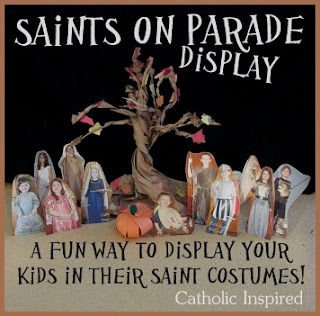 We have a whole parade of saints!! 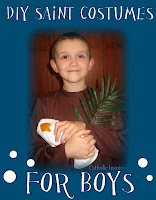 Hope you are having a blessed feast day! BTW:Don't forget to pray for all the souls in purgatory tomorrow. It's all Souls day! Your display is so cute, perfect for All Saints. 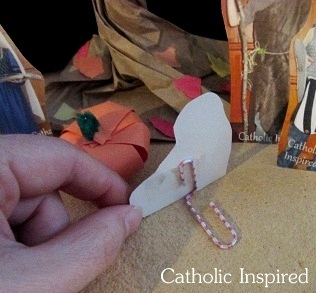 Hi Jennifer, what a great way to celebrate All Saints Day! Love that you used your children's pictures! Thank you so much Karri and Noreen!! And Thanks for taking the time to comment. God Bless you both! Super cool! I bet the kids just love looking at them and even fun to play with. What a FABULOUS idea Jennifer! 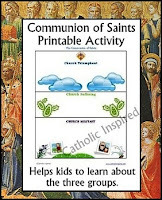 We love how this can also serve to remind the children of their own saintly potential!